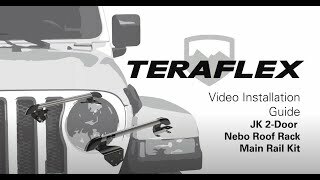 The purpose-built TeraFlex JK 2-Door Nebo Roof Rack System incorporates OEM aesthetics and styling with rugged performance to increase cargo carrying capacity for your adventures. The factory finished appearance makes it look at home in the city or off-road in a fully-loaded Rubicon. The low-profile streamlined design has been tuned to reduce air resistance and noise when unloaded. The aluminum extruded main rail utilizes the industry standard 10-series T-slot mounts that readily accept accessory mounting hardware to carry gear such as a shovel, axe, or recovery jack. The optional 4-Piece Cargo Slat Kit (sold separately # 4722052 or # 4722062) provides a platform to hold gear and allows direct mounting of popular sport equipment carriers without need for a load or crossbar. • Drilling required into factory hardtop. • Optional 4-Piece Cargo Slat Kit (# 4722052 or # 4722062) sold separately for additional mounting options.